Location: From Beaver Hills House Park walk east through the alleyway towards 104 St. just north of Jasper Ave. Artwork hanging on south facing exterior wall of 10130 – 104 St.
Another well-known and active member of the Edmonton art community is artist and architect Will Truchon. 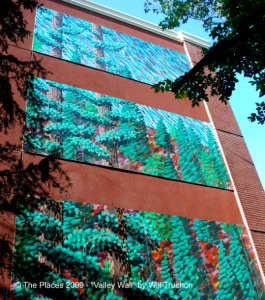 Valley Wall was a collaborative work commissioned as part of the 104 St. Promenade, a civic effort inviting art and good urban design to 104 St. Biography: Will Truchon earned a Bachelor of Fine Art at the University of Manitoba in 1992, a Master of Fine Art from the Ohio State University in 1995 and a Master of Architecture from the University of Calgary in 2011. Since the mid-eighties, he has held a variety of positions including gallery technician, ceramic technician and art instructor. As an artist, Will works in several mediums such as ceramics, painting, multi-media sculpture and photography. Among his other artistic interests are life-long passions for architecture, industrial and graphic design, film, music and general entertainment. From 1997 to 2007 he was a partner of the Hot Pot Studio that designed and distributed hand-painted tableware to Western Canada. From 2001 to 2007, he was Artistic Director of The Works Art and Design Festival showcasing quality art in Canada and abroad. As an intern architect registered with the Alberta Association of Architects, Will is enjoying the developmental process to fulfill his certification.